I am the person mentioned above and I live at the address previously supplied to the Leicestershire police. 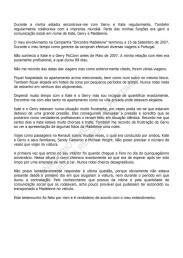 I was questioned about my association with Gerry and Kate McCann and about my visit to Portugal in the summer of 2007, after the disappearance of their daughter, Madeleine McCann. I am the owner of a Public Business Consultancy company. 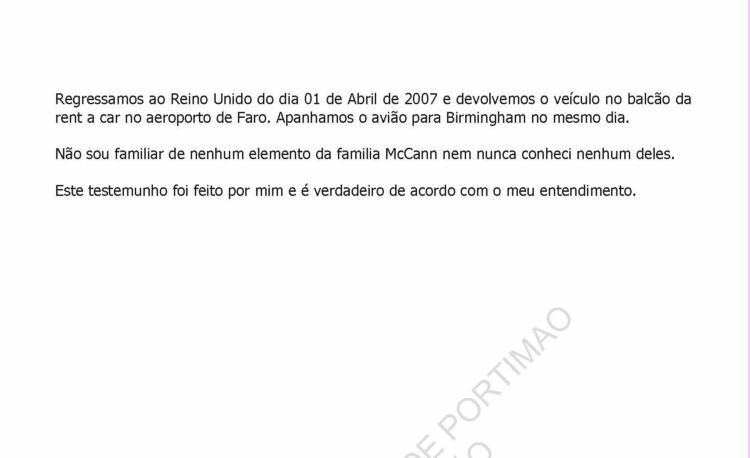 During the end of the month of May, beginning of June I was contacted by recruitment consultants who asked me whether I was interested in working for the campaign to find Madeleine McCann. This occurred after some advice given to Kate and Gerry by Alex Woolfall. Alex Woolfall is the public relations officer for Mark Warner. I agreed to presenting my CV for the appreciation of Kate and Gerry McCann. A short time later I received a phone call from Gerry who asked me a number of questions by phone. It was almost a mini interview that included questions about me and continued to talk about the kind of support that they were looking for. Later I went for another interview in London. 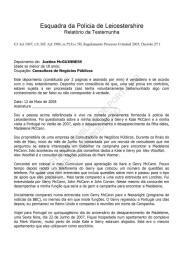 I was interviewed by Gerry McCann, John McCann and John Corner. On the same day I agreed to carry out my function which would be to manage the campaign to find Madeleine. 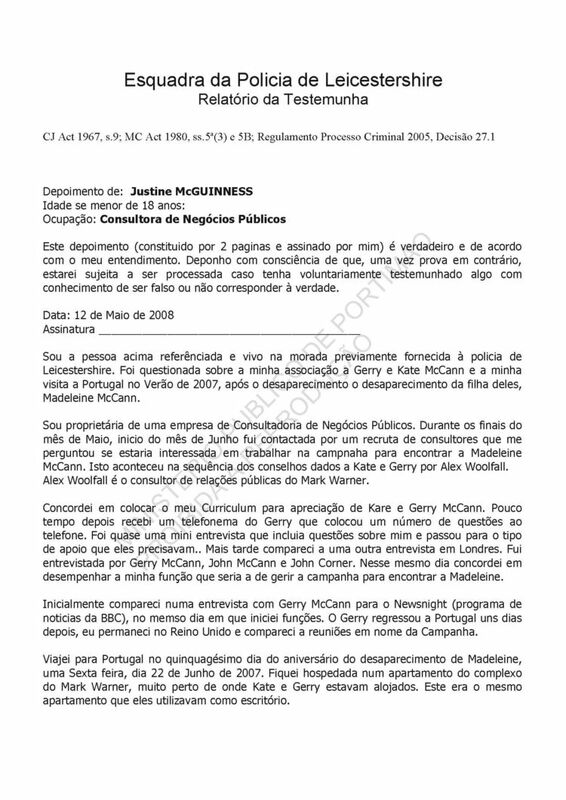 Initially I appeared in an interview with Gerry McCann for Newsnight (BBC news programme) on the same day that I took up my functions. Gerry returned to Portugal some days later, I stayed in the UK and attended meetings in the name of the Campaign. 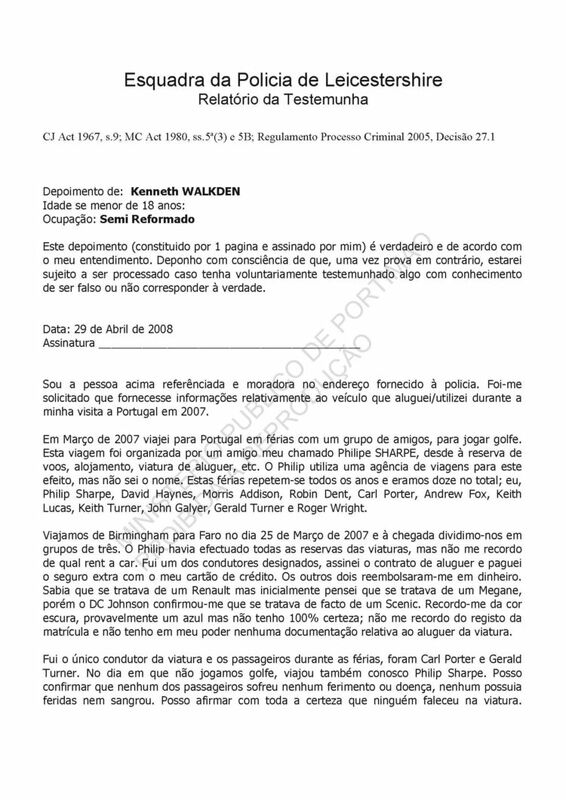 I travelled to Portugal on fiftieth day anniversary of Madeleine's disappearance, a Friday the 22nd June 2007. I stayed in an apartment in the Mark Warner complex, very close to where Kate and Gerry were staying. This was the same apartment that they were using as an office. During my stay I would regularly meet with Gerry and Kate. I also regularly collaborated with the world press. Part of my functions was to manage the press communications in the name of Kate, Gerry and Madeleine. 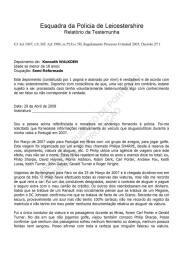 My involvement in the 'Find Madeleine' campaign ended on 15 September 2007. During my time as director of the campaign I made several trips to Portugal. I did not know Kate and Gerry McCann before May 2007. My relationship with them was purely professional and lasted for 89 days. I do not remember the dates of the trips but as was mentioned previously, there were several trips. I stayed in the apartment mentioned previously, as well as in another apartment in the same block. I also stayed in hotels in the area for short periods of time. I never noticed anything strange about any of the lodgings. I spent much time with Kate and Gerry but I am unable to quantify exactly how much time. I would meet them at their apartment as well as in the private villa where they were staying. Kate and Gerry were in a very frustrating situation, at times I could see that they were under great pressure. They managed to cope with the pressure and I credit them with behaving as true professionals would have done in an identical situation. I remember that on certain days Kate was very tearful and sad. I also remember Gerry's frustration upon seeing the presentation of some photos of Madeleine one night. I travelled as a passenger in the Renault Scenic many times, which was driven by Kate and Gerry and their family members, Sandy Cameron and Michael Wright. I cannot specify the number of times that I travelled in the vehicle. The first time that I travelled inside the vehicle was when I arrived at Faro on the fiftieth day anniversary. At that time the car smelt exactly like what you would expect after having been cleaned by a rental car company. I never noticed unpleasant odours. Unfortunately I cannot answer the last question because I was obviously not present from the first day they hired the car, neither during the period of the lease. Because of my knowledge of the routine and the amount of members from press that surrounded them, I think it unlikely that they could have hidden or transported Madeleine in the vehicle.